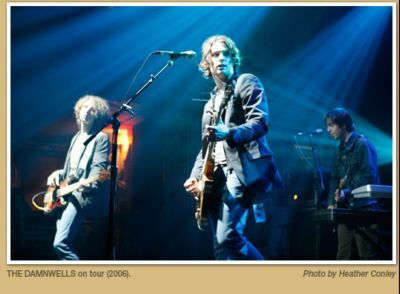 Those who have read this blog for a while might have noticed subtle hints of my slight obsession with the band, “The Damnwells“. And when lead singer Alex Dezen dropped a new song on their myspace page, it became clear to me that yet another post was needed. But before we get to the new tune (yes, it’s down at the bottom, along with some others), some background. It’s hard to describe how much the music of The Damnwells excites me. It’s much like the first time I heard Dispatch, or Ryan Adams, or Ben Harper… and that’s no small compliment from me. There’s a strong alt.country vibe to their stuff (not surprising, considering drummer Steven Terry was a member of the oh-so-missed Whiskeytown), but it also hearkens back – for me, at least – to the times of the Gin Blossoms. And there’s just something about Alex Dezen’s voice and lyrics; it’s like he knows where you’re coming from, and meets up with you on the journey. “In 2001, a photo assistant named Alex Dezen asked a couple friends to record a few songs with him. 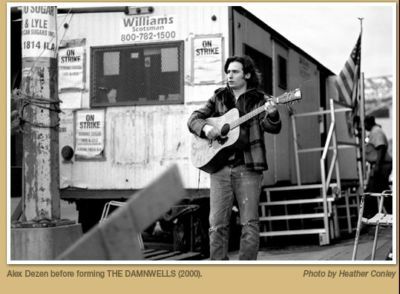 Shortly thereafter they would form the Brooklyn based rock band THE DAMNWELLS. Two years later they had toured the country, opened for rock legends, and had a song featured in a major motion picture. By 2004, they had signed a major record deal with EPIC Records (Sony/BMG). Watch the trailer, and tell me it doesn’t excite you. Word from Chris (Suchorsky, the film’s director), is that the DVD should be made available in the US by Spring. And I’m freaking out. Up until now, I’ve only seen segments of the film, but not the whole thing. “Really, when you consider all the pressure and nonsense—both existential and metaphoric—we always had to deal with every time we went into the studio, this will be the first Damnwells record we will ever be able to just make. ‘No pressure,’ Paul, our A&R guy at Rounder says. ‘Make the record you want to make.’ What a crazy idea! Not like we were ever making anyone else’s records, but there was always compromise. Where art and commerce meet, there has to be. Your mixed-medium, six foot canvas doesn’t fit in the six by three inch display case at Wal-Mart, and no amount of dieting or exercise is ever gonna fit your square peg in that round hole. Compromise is a part of life—at least the kind that includes a roof over your head and food on the table. So now that we’re supposed to make this record, the one we want to make, without the pressure and nonsense, I think I may be feeling a little Stockholm syndrome coming on. How the hell am I supposed to do that? The guy just has this amazing way with words, and if there was one person I could sit down and have a beer with, Alex Dezen would definitely be one of my frontrunners. Anyway, on to the tunes below. The first track is the new release on their myspace page, entitled “Down With The Ship“. Dezen has this talent of crafting these incredibly powerful songs, accompanied simply by his acoustic guitar and pure heart (as anyone who has heard his “Live Performance at the Hotel Cafe 10/14/07” can attest to. It’s floating around the net, so take a look for it. If you’re really struggling, drop me a line, as I have the whole show in a zip file). This song is no different. The guy’s voice absolutely wrecks me. I’ve included some of their other singles below, simply because you should be listening to this. The first is a cracker of a tune (and the first of theirs I heard actually), from their 2003 release, “Bastards of the Beat“, called “Kiss Catastrophe“. It’s undeniably catchy. Try not to get into it. I dare ya. The next track is their tune, “I Am A Leaver“. 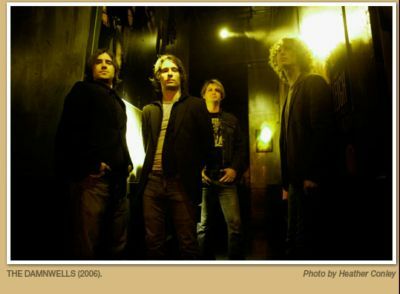 This is off their last album, “Air Stereo”, and is probably the song that has garnered The Damnwells the most mainstream attention. Again… if you don’t find yourself singing along with the chorus, I don’t know what’s wrong with you. One of my “things to do before I die”? See The Damnwells, live. And it’ll happen. Cool Gilly, thanks for that! Hey everyone… Gilly has a copy of the show (and some other seriously awesome Damnwells resources). Click on the link in her name in the comment above, and navigate your way from there. Just came across your website…. I couldn’t agree with you more…. The Damnwells are unrecognized and unappreciated in the music industry. Alex Dezen is an amazing singer/songwriter and why The Fray isn’t opening for The Damnwells, I don’t know. It’s just WRONG! I recently saw The Damnwells in Austin during SXSW with my husband. As we were waiting for an acoustic appearance by Alex on an upper deck at a small venue called Cheers, we caught sight of him standing on the lower level, texting on his iPhone. Well, I started acting about half my age (currently 42), jumping up and down, excited to see the “real” Alex Dezen, standing a mere ten feet away from me. How could he not look up to see my ridiculous behavior? Anyway, he smiled. Of course, I practically raced down the stairs, with my husband following, filled w/ anxiety and anticipation of giving him a great BIG hug. Needless to say, I did make a fool of myself, but it was worth it….. I met Alex Dezen! My husband and I talked to him for a few minutes. We mentioned that we LOVE their new album and we were super happy to pledge/support it. I went on to tell him how GREAT he is…… Yes, he’s just a super nice guy… It happened, right then and there, I “fell in love” with Alex Dezen. There’s something about him that had a serious impact on me…. left me in “awe!” Be it a “crush” (as my husband pointed out to me on our drive home) or maybe the fact that he’s genuine, someone who cares and believes in what the band is doing and realizes how hard it is to make it, but determined to keep his fans happy. Just can’t really pinpoint what it is about him, but after reading your blog, it seems as though you can relate. He never did play the acoustic show at Cheers that night. He had told us while we were talking that he wasn’t thrilled with competing with music in the surrounding blocks. He didn’t think his voice would hold up to the other bands (which were crazy loud) and didn’t have enough time (he tried) to get the band members to the venue. Here’s the cool thing…. when he realized that the acoustic set wasn’t happening, he signaled us to come down to the lower level. He told us he was pretty sure he was going to bail and asked us for our names (our names were in his iPhone! ), so he could put us on the guest list for his show (w/ the band – wristband only) later that night. No promises, but he would try. Honestly, how many other musicians out there would do this? How many other musicians out there would post on FB “the names of the fans who waited for my acoustic show earlier today are at the door of The Tap Room” for the 10pm show.” He took care of us… he really took care of us…. so nice, just unbelievably nice. Well, I saw Alex again that night inside The Tap Room about a hour before The Damnwells performed…. My heart was racing and I felt like I was jumping up and down underneath my skin. I didn’t approach him a second time, but I’m sure he saw me wiggling with excitement from a distance. Of course, I had to stand in front, center stage, gazing up at him throughout their twenty minute set….. he probably thinks I’m one of those CRAZY fans. He never did make eye contact with me while he was on stage, and I can’t say I blame him. That’s alright. I met Alex Dezen that day and saw an awesome set that night. Luckily, we did see him after the show briefly and thank him for putting us on the guest list…. So, I did get one more hug from Alex…. made my night! I was certainly in a daze all weekend, pure happiness. I couldn’t get Alex off my mind for days. It’s been almost a week since we saw him…. been listening to the record every chance I get and EXCITED to and anxious to see them play at a small venue downtown on April 7th. I think I’ll be sure to make less of a fool of myself… maybe I’ll get lucky and get to talk to him again. He’s just amazing. He’s downright amazing. Sure hope he reaches the kind of stardom that he deserves someday soon… Like I said, he’s amazing. And, for those who don’t know of The Damnwells, they’re truly missin’ out! Tell Alex I say hi. Being in Australia, I’ll have to wait for their world tour before I get a chance to see them live.